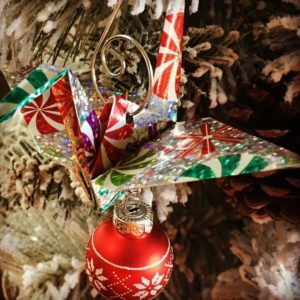 The Origami Cranes are ready for flight..
…starting Nov 1 through Dec 21 or until they have all flown the nest!!! Origami cranes are the universal symbol of love, hope, peace and joy. Every ornament purchased for $5, 100% goes directly towards the benefit of the children at WRC. Last year’s sale raised $1,500 and Friends of WRC has a goal to double that amount this year. Proceeds contributed to the refurbishing of the children’s playground with new tire structure, car and more! The Friends of WRC’s mission is to provide positive, enriching and memorable experiences for the children residing in the WRC transitional and shelter housing programs through their fundraising and advocacy activities. To find out how you can join Friends are learn more about the work they do for WRC click here. 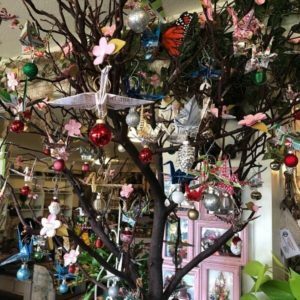 This fund raiser is hosted by Friends of WRC and supported by: Erica @ Succulent Cafe + The Origami Guy who creates and donates all the ornaments. The Succulent Café wraps you in a relaxing friendly environment and surrounds you by living art. Enjoy coffees, smoothies, teas, and pastries by the peaceful sound of the water fountain, or the warmth of the fire pit. The Café is located at the south end of State Street where State intersects Oak Street. The Succulent Cafe is dog-friendly and provides treats for your dog.